Every spring, I'm on a roll with fresh fruit, which means that I try to put fesh berries and every other fruit which I can get my hands on into everything I prepare. I still wonder why anybody would want coffee to taste of anything else than coffee, and the only explanation I can find is that it is the combination of flavours which makes it desirable to add syrups or other stuff to your coffee. As much as I love plain black, unsweetened coffee, I can't keep off of fancy lattes and mochas. 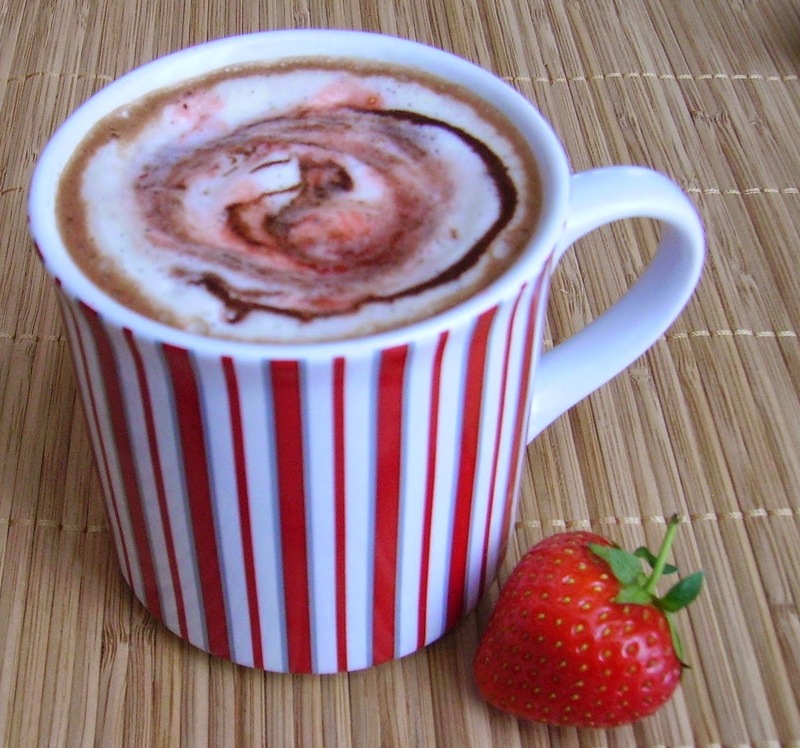 One of my favourites is fresh strawberry mocha. Like raspberries, strawberries don't have to be boiled to get syrup from them. They are soft enough to press them through a sieve. Just make sure you have ripe, aromatic berries, and you'll be rewarded with a mocha that bursts with flavour. I prefer making my syrups with runny honey, but of course you can use any syrup you like. If you want to save calories from sugar, you can use less syrup or honey with the fruit puree and add some stevia to taste. Chop the strawberries and press through a sieve. Reserve about 1 teaspoon of the strawberry puree and put the rest of it into a mug. Add 1 teaspoon cocoa powder and 2 teaspoons honey or syrup to the mug (or less, if using stevia to taste). Mix well until combined. 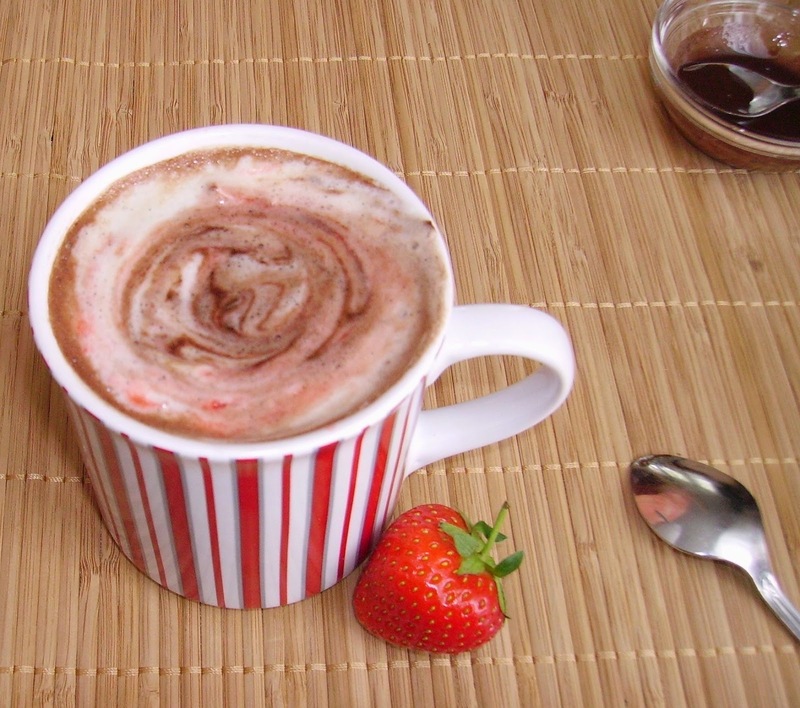 Combine reserved strawberry puree with 1/2 teaspoon honey or syrup (adjust sweetness to taste), and 1/2 teaspoon cocoa powder with one teaspoon honey or syrup (or to taste). Heat milk with vanilla to taste (I use to scrape out 1 inch of a vanilla bean). 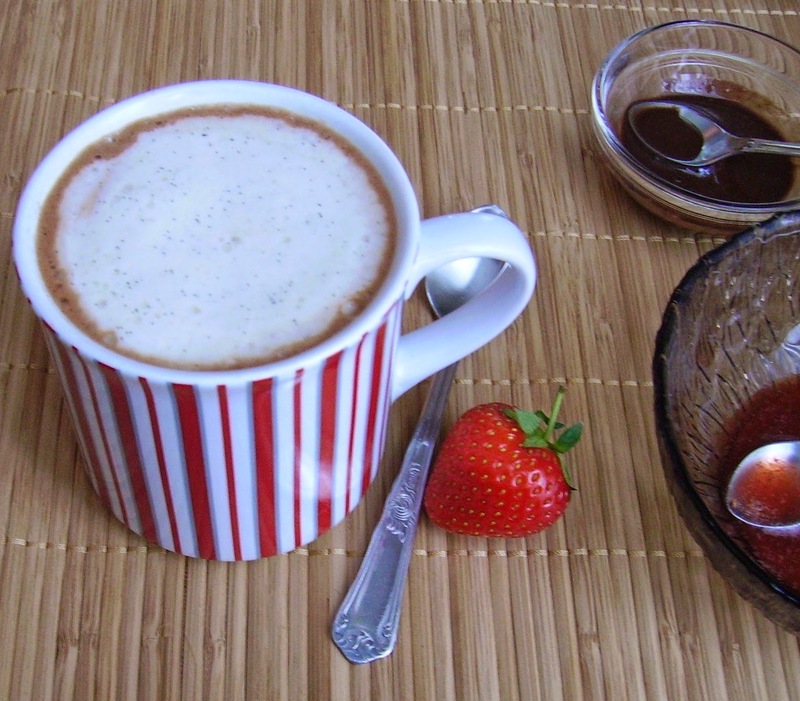 Brew coffee and add to mug, stir to combine with the strawberry-chocolate syrup. 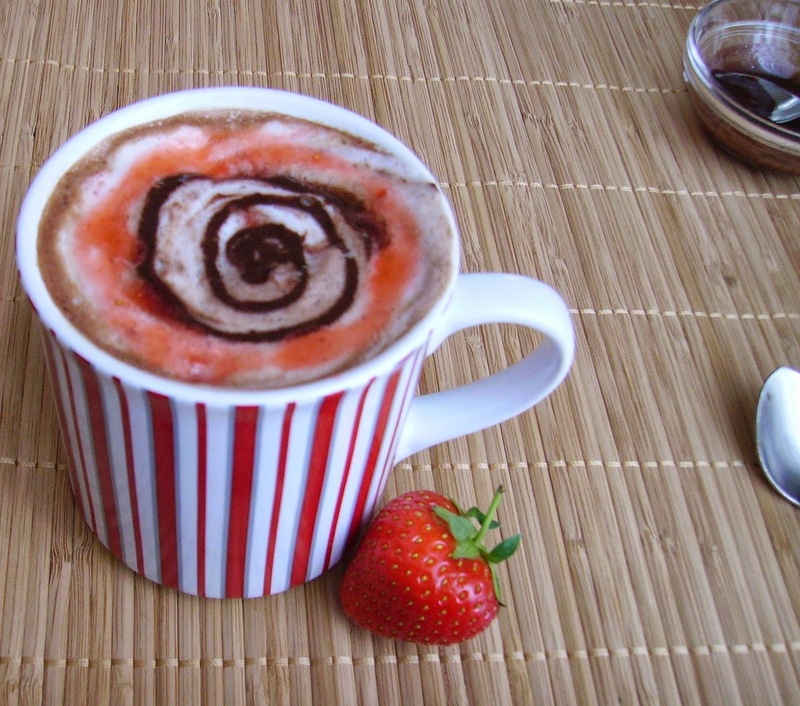 Add steamed milk and top with chocolate and strawberry syrup. What do you prefer, hot mocha or cold frappuccino? Thank you so much BK :) I can't wait for the fresh strawberries to appear here, too, so I can start messing around with them again. I'm happy that you tried this recipe and enjoyed it as much as I do. Thanks a lot for this wonderful creation I prepared the flavor as you described and I'm very happy I did it as you described as this removed the seeds! My strawberries were not very red, so the color was little pale, but the taste great! The preparation was very easy and I will make this again changing the flavors! Hugs!